Santa Rosa, California. – MindShift Gear has released the lightest, most compact camera cover for outdoor photography, the UltraLight Camera Cover, available in three sizes and two colors, Black and Tahoe Blue. 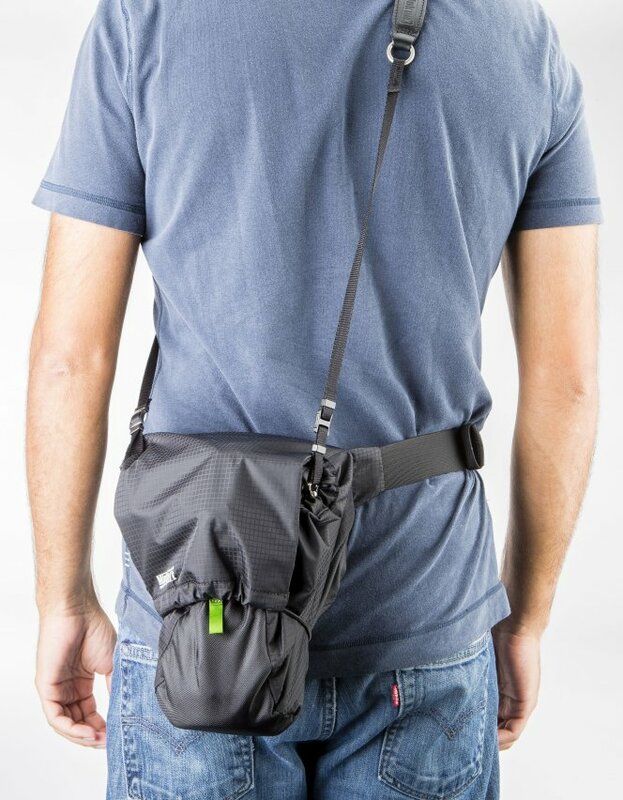 This “skin-style” camera pouch/cover is designed for outdoor, nature, and action photographers who wear a normal or pro DSLR camera with small to medium lens out on their chest, ready to shoot. Its adjustable shock-cord on lid allows the cover to fit multiple camera and lens combinations. With the UltraLight Camera Cover photographers can use their camera neck strap for extra support in active adventures. Its orientation brings the camera closer to photographers’ center of gravity, allowing greater balance and stability during extreme action. It doesn’t block the view of their feet like a bulky camera case. It also fits under any backpack. It features a weather-resistant flap cover and lightly padded front, bottom and rear panels. It accommodates lenses facing out or facing down depending on the photographer’s carrying preference. For superior water-resistance, its all exterior fabric has a durable water resistant coating while the fabric’s underside is coated with polyurethane. It uses 100D rip-stop nylon, 210D velocity nylon, nylon webbing, 3-ply bonded nylon thread. SANTA ROSA, CALIF. – MindShift Gear announces the release of the first case designed for quick access to round, square, and rectangular camera lens filters, the Filter Hive. The Filter Hive solves organizational and functional problems of conservation, landscape, outdoor action, and wildlife photographers who need quick access to filters of different shapes. The filter case resembles a bee hive with padded, felt-lined slots that protect delicate glass and resin filters. SR buckle allows it to be hung from a tripod for quick access. 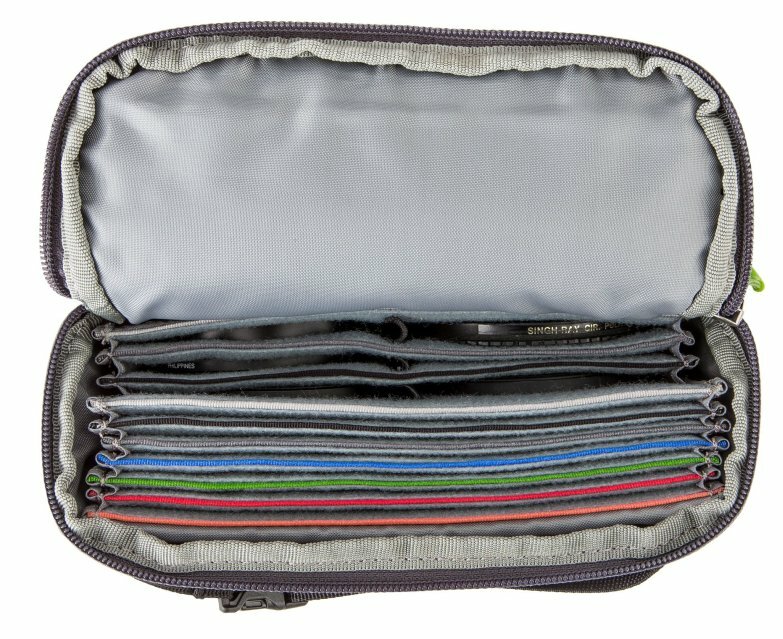 Its color coded organization allows filters to be located quickly. It has a front zippered pocket for quick access to a lens cloth and its YKK zipper keeps out dust, moisture and debris. Exterior: All fabric exterior treated with a durable water resistant coating while fabric underside is coated with polyurethane for superior water resistance, YKK® zippers, 100D rip-stop nylon, 210D velocity nylon, nylon webbing, 3-ply bonded nylon thread. Interior: 200D polyester lining, nylex lined filter pockets, closed-cell antilon foam, nylon binding tape, 3-ply bonded nylon thread. This entry was posted on Wednesday, March 5th, 2014 at 11:41 am	and is filed under News, Reviews, and Tips. You can follow any responses to this entry through the RSS 2.0 feed.